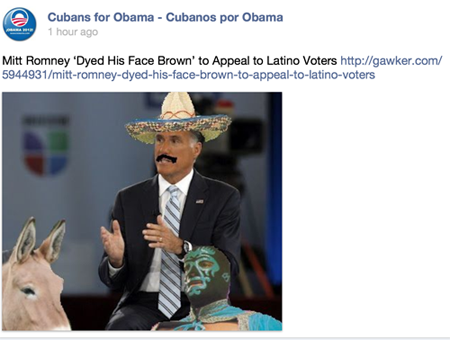 Not only is this on the Facebook group page "Cubans for Obama", but it has become an accepted submission on Gawker. This page is a community page of the official page of Barack Obama on Facebook, with the picture being submitted by an official contributor of the Facebook group. I am not surprised that Democrats feel untouchable as they mock those of Mexican heritage considering that the Democrats have engineered the mass deportation of 1.6 million illegal immigrants and the murder of over 300 Mexican citizens due to the Fast and Furious debacle while being protected by the mainstream media. If the Republican Party was smart, they would market this Facebook post and continue to expose the Democrat party for who they are, a power machine that is truly racist when anyone goes against their machine's agenda. I wonder how Florida voters would respond to this picture going up on the "Cubans for Obama" Facebook page under the official contributor's name. I am sure Cuban Floridians and Floridians of Mexican descent would distance themselves from this garbage. It's not okay to hide behind a double standard on race. Democrat operatives and apologists can disagree with me, but I think we should advertise their actions to voters and let the voters decide what kind of representation they would rather want.